To find the best baby gates of 2019, we pulled together over a dozen safety gates and put them through hands-on testing and evaluation. We considered gate installation location (doorway, hallway, stairs), sturdiness, safety, ease of installation and use, and flexibility to fit into all sorts of situations. We start by reviewing gates designed for doorways and hallways, and then consider gates designed for the top or bottom of stairs. 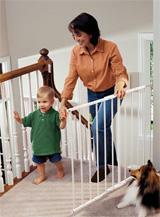 Never use a regular baby gate near a stairway! To learn more details about our testing to find the best baby gates, scroll down to the bottom of this article! 1. North States Supergate Baby Gate. Usually about $50. The top-rated North States Supergate is one of the best reviewed baby gates on the market, and is fairly priced. It is a tension gate, meaning that there is no assembly required, it basically squeezes itself into your doorway. They provide wall cups that hold the tension arms in place to prevent slipping forward/back when baby pushes or pulls on the gate. The wall cups do screw into the wall, or you can use the double-sided mounting tape like we did. The tape comes in the box. It has a 2" tall threshold on the bottom, so it is NOT recommended for use at the top of stairs. We found that the gate is very sturdy and uses a clever locking mechanism that has two settings - one that requires only lifting the gate to open it, and another that involves twisting the lock for extra security. In both cases, we found that it only takes a couple minutes of practice to perfect one-hand opening. The gate also swings both directions for convenience, and swings closed very easily (but not automatically). You can lock it into the open position as well, as needed. The gate includes extensions that come with it, and in our testing, we found that it can fit doorways from about 31" to 38" wide. It measures 29" high when installed, making it easy for taller adults to step over it rather than opening it (we do this a lot!). This safety gate is also available in white or bronze, and this is the third year that this gate has appeared at the top of our best baby gates list (and for some great reasons!). Interested? 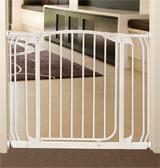 You can check out this North States Baby Gate here. 2. Summer Infant Deco Baby Gate. Usually about $65. The top-rated Summer Infant Multiuse baby gate is basically tied with the #1 North States gate, so deciding whether to make it #1 or #2 was difficult. The gates differ in two primary ways. First, the Summer Infant gate is 34" tall (36" tall at the peak) while the North States gate is only 29" tall, making it an extra tall walk-through gate. It is difficult to know whether this is a pro or con. On the plus side, parents don't need to reach down so far to open the gate, and they don't need to worry about climbing as much. On the negative side, in our testing we realized that a lot of men and taller women like to simply step over the gate sometimes, especially when their hands are full or they're in a hurry. You will be hard pressed to step over this extra tall gate, so that's a definite down-side of its tallness. Second, the Summer Infant gate swings shut (swings closed) and locks automatically, which is super helpful - no more turning around and pushing it to shut. However, this also means that it uses a stop bracket (which is reversible to change swing direction), which sometimes snags your pants leg as you pass through. Couple that with the narrow opening (about 17" wide opening), and it can be a pain sometimes. The North States gate swings both ways for convenience, but doesn't auto-close like this one. Also, the Summer Infant gate is tension-mounted (even with the hardware kit, it's still tension-mounted) and very sensitive to the amount of tension you set during installation; if you over-tension, it will squeeze the opening too narrow and the gate won't shut; this isn't specific to this gate, however, so if you find your gate isn't closing properly always check tension first. So, there are some pros and cons for each, and you'll need to make an informed decision for your particular situation. Overall, however, you're getting one of the best gates currently on the baby market, regardless of whether you choose the Summer Infant or North States Supergate. Note that the Summer Infant Multiuse gate markets itself (on Amazon and on its own website) as good for use in doorways or at the top of bottom of stairs. They do this by allowing you to choose whether you're using a tension-fit (doorways) or mounted (stairs) option, while making sure you change gate swing direction so it doesn't open over the stairs. In our opinion, however, because the gate has a bar across the bottom that may pose a tripping hazard, we do not recommend installing it at the top of stairs. In fact, a parent emailed us and let us know that the instruction manual for the Deco actually says "to prevent falls, never use at top of stairs." In our testing, the widest doorway we could fit the gate into was 48" using the included extensions, so this definitely qualifies as one of the wide gates that could be used in larger doorways and openings between rooms. Interested? You can check out this Summer Infant Baby Gate here. 3. DreamBaby Chelsea Extra Tall Baby Gate. Usually about $90. The DreamBaby gate is very similar to the Summer Infant option above. It is a tension extra tall gate with a 2" threshold along the bottom edge, very sturdy construction, a child-proof locking mechanism, one-handed opening, swings both directions, and automatically swings shut. The opening is about 18" wide, which is a little better than the above options. This gate, if bought from Amazon, includes extensions for people with doorways larger than the typical 31", which is why it's the "extra tall and wide" version. In our tests, we could get it to fit a doorway as small as 38" wide, and as wide as about 70" (which is more like an opening between rooms than a doorway!). If your doorway is smaller (normal, like 28-32" wide), you can get the same gate but not as wide for about $50. Disadvantages? It doesn't have a hold-open feature to keep it open at 90-degrees, unlike the North States safety gate. Also, in one of our test units, the locking mechanism failed after a few months of use. The other one is still going strong without issues, so not sure what happened in the quality assurance department. As with any gate, be careful of small parts (screws, nuts) that can fall off if not tightened properly, so be sure to occasionally check the gate for loose parts. Interested? You can check out this DreamBaby Gate here. 4. Munchkin Easy Close Metal Baby Gate. Usually about $50. The Munchkin Easy Close metal baby gate is well-reviewed, but not quite as well as the North States or DreamBaby models. It is also a tension gate with a 2" threshold along the bottom edge. The locking mechanism is well-reviewed as highly child-proof. The gate does not have an auto close feature, and some parents report that it can be annoyingly difficult to push closed sometimes, particularly when you only have one hand available. Even if you swing it closed forcefully, it requires you to open the latch mechanism to get it to latch shut. We also found that this particular tension-fit gate requires quite a bit of outward pressure for mounting, so it is very restricted to solid doorway frames on the sides. The Munchkin Easy Close metal gate fits doorways as narrow as 29.5" wide, and up to 35" wide when using the one included extension. If you're trying to fit a wider opening, you'll need to purchase some more extensions. Interested? You can check out this Munchkin Baby Gate here. 5. Regalo Easy Step Walk-thru Baby Gate. Usually about $35. The Regalo Easy Step baby gate is a great option, and one of the best-selling baby gates on the market. Because it is not for use near stairs, it uses pressure mounts for installation that push out against two walls. It fits openings from about 29-39" wide, and in our testing, we needed to add an extension to get it to fit one of our larger openings of about 42". Or you can just purchase the wider version that includes extensions for up to 50" applications, or the enormous and frankly quite excellent Regalo 192" super wide baby gate! That Regalo super wide gate is perfect for sectioning off an entire room or making a circular playpen. The gate uses a unique lever-locking mechanism, which we found logical to use, but some of our reviewers said they needed to use two hands to open it (to pull back and lift up simultaneously), which was a pain. Personally, my husband and I could do it with one hand after getting the hang of it. We also found the opening pretty narrow, especially for wider thighs and hips, or if you're carrying something. It's also rather short, so if your toddler is becoming a monkey this definitely won't stop them. There is a taller version of this Regalo gate, which you can check out here. Note that the gate only swings one way, it cannot be reversed. Also, when you close it, you need to latch it yourself using the same (difficult for some) locking mechanism. Overall, we thought the build quality was quite good, and when mounted correctly it felt very secure and not possible for little fingers to figure out (with older kids about 5+ able to figure out with both hands). Note that while this gate suggests it can be used at the top of stairs, we do not suggest this type of application: it has a step-over rail at the bottom of the gate, which is a tripping hazard for that type of application. Interested? You can check out this Regalo Baby Gate here. 6. Evenflo Soft and Wide Baby Gate. Usually about $40. The Evenflo Soft and Wide baby gate uses a different concept than all the other gates on this list. It doesn't have a door, and it doesn't swing open and shut like most other gates. Instead, it's a bit like those old wooden expansion gates our parents used when we were kids (the retractable baby gates that were really good at pinching fingers, and easy to climb on! ), in that you install it and leave it. As long as it's not too high for adults to easily step over, then it usually just stays in place most of the time. Because it either needs to be removed or stepped over, it's not a good option for the bottom or top of stairs. It uses a pressure-mounting system, pushing out lateral force against the two adjacent walls. This particular baby gate is actually pretty nice; in our testing, we liked that the gate itself had nice padding and cloth over it, and that it used a sheer mesh that baby can look right through to see what's going on in the next room. It's a great basic gate that's cute, sturdy, and reliable. The installation was much easier than any gate you need to screw into a wall, as this one requires no tools or anything. You just adjust the outer knobs to the right diameter of your opening, and then secure the gate in place. There is a good installation video here, that we found really helpful for our install process. The gate adjusts narrow enough for small doorways (down to 38" wide) and wide enough for openings between rooms (up to 60" wide). It's the usual 27" tall, but that's if you mount it basically all the way down toward the floor - you can also come up a few inches from the floor and make it quite a bit taller. That makes it more difficult for kids to climb over the gate, but also makes it more difficult for you to step over as well! We know a lot of parents who use this type of baby gate in their homes, though it doesn't work very well when you're wearing a dress or skirt or if you're shorter than like 5'5"! Anyway, this is a great baby gate if you are looking for a stationary gate that's high quality, relatively easy to install, durable, and safe for your baby. Here are the best baby gates of 2019, for the top or bottom of stairs. The top of the stairs is a difficult and dangerous location, and there are only a few baby gates for stairs that we recommend. Here are our criteria: no step-over bar along the bottom edge (you do not want to trip at the top of your stairs! ), can be attached to a variety of configurations (railing posts, walls with moldings), wide enough to fit a variety of stair configurations, doesn't automatically swing shut (so there is no risk of the gate swinging and bumping you or a baby in the back, risking a fall down the stairs), is easy to use in our hands-on testing, and well-reviewed by parents. 1. Kidco Safeway Safety Baby Gate. Usually about $45. 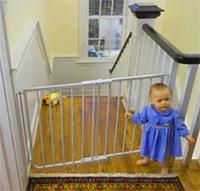 This top-rated Kidco safety gate is the best all-around for the top of the stairs. We also think it deserves a spot on the doorway list above, but this is specifically designed for the top of the stairs so we'll keep it here. The Kidco Safeway gate meets a lot of the criteria we mentioned above: no step-over bar along the bottom edge, can be attached to railing posts and/or walls, and is well-reviewed. It also has a one-handed operation, doesn't automatically swing shut, and in our testing we found it sturdy and reliable. It also prevents swinging out over the stairs with a one-direction swing/hinge mechanism. You can easily reverse this for your specific stairway configuration. Obviously, at the bottom of the stairs it can only swing one way to begin with, but this becomes relevant for the top of the stairs mounting. It is also available in black or white, to suit different styles. In our testing, we found that the provided screws were a bit too short and may not have a strong enough hold. In the end, we purchased different screws, though we do think it probably would have been completely fine with the existing screws. For people who don't mind drilling/screwing into their railings, this gate is an excellent option. We configured the Kidco Safeway gate for openings from 28" to 43.5" wide, and even got it to work really well on an oddly-angled wall by using the included hinge mounts. Interested? You can check out this Kidco Baby Gate here. 2. Cardinal Gates Stairway Angle Baby Gate. Usually about $70. This Cardinal baby gate comes in white (pictured), brown, black, and wood. It uses a really unique locking mechanism that none of our testing kiddos could figure out, which is a good thing! The best part is that it took about 5 tries for adults to master it, and once they did it was easily unlocked with one hand. The secret is to push down on both latch tabs while pulling up on the gate. That type of manual dexterity won't be found in a sneaky toddler trying to thwart your every attempt at keeping them safe! It meets all of the criteria we mentioned above: no step-over bar along the bottom edge, it can be attached to railing posts and/or walls, and is very well-reviewed. It doesn't swing shut automatically behind you, though it does close automatically if you give it a forceful swing shut. Like the Kidco gate, this can be mounted at up to a 30-degree angle for those imperfect stairway scenarios, so this is a great baby gate for unique angles between railings and adjacent walls. Notice how the pictured is mounted at an angle, that's a great capability that can fit basically all sorts of wall and railing layouts. It does have a stop-bracket to prevent swinging out over the stairs, but this is optional if you decide not to install it. The width adjusts from 26" to 40" wide, and it is just under 30" tall. In our testing, we found the Cardinal gates installation a little complicated, but we do note that there is a great video here (see the 5th image) that shows a step-by-step installation. Very helpful for those who aren't super handy, and the Cardinal Gates Stairway models are some of the best baby gates of the year! Interested? You can check out this Cardinal Baby Gate here. 3. Evenflo Easy Walk Thru Baby Gate. Usually under $50. This is the first year the new Evenflo Easy Walk Thru gate appears on our list of best baby gates, and it's here for some really great reasons! The gate stands about 30" tall, which means that if you mount it 2-3" off the floor, it will stand about 32-33" high. It has no bottom rail, so is intended for use at the top of stairs, though we were also able to get it working very nicely in regular doorways as well. It expands to fit openings from about 29" to 42" wide, but is not as versatile as some other options (like the ones above) in the angles it can accomplish or types of surfaces it can mount to. It uses two screw-mounts on each side to permanently mount to most surfaces, including wood and drywall (assuming a corner with a stud behind it, or the use of heavy duty anchors). It can be mounted in either direction (left or right-handed opening), as the gate can swing either way. It includes a removable swing-stop bar that can be attached to prevent the gate from swinging out over the steps. We thought the lock release handle was pretty easy to use, and after a few tries can be opened with one adult hand, while still being too difficult for even our sneaky 3-year-old to figure out. Speaking of the lock, there is a handy red/green indicator to tell you whether the gate is securely locked, which is reassuring. Note that if you have an opening wider than 42", there are no extensions available that we are aware of. After 5 months of use, the gate shows consistently great performance, without any signs of malfunction coming any time soon. We do suggest that once you have the gate mounted in your preferred position, that you use something like a zip-tie or a bolt/nut to tighten the gate into your preferred width. This is because the width of the gate can actually be pushed and pulled when the gate is open, and this gets more possible over time. With a little zip tie to secure the two gate pieces together, the problem is solved forever. You can also go wild and drill a hole through both pieces and attach them to each other using a bolt and nut, but it seems like overkill. 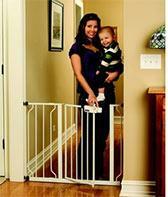 Overall, an excellent and easy to use baby gate with some great features! Interested? You can check out this Evenflo Baby Gate here. 4. North State Supergate Stairs Baby Gate. Usually about $50. The North State baby safety gate for the top-of-stairs is basically tied for second place - it's a toss-up between the Kidco and North State options. It has all the great features as the Kidco gate, such as one-handed open, reviewed as sturdy and reliable. It doesn't swing shut automatically, but if you give it a forceful shutting swing it does lock automatically without any issues, just like the Kidco. There are only a few differences. First, the North States is brown/bronze or linen color rather than white or black, and fits applications that are a bit wider (up to about 46"). People actually report that the North State locking mechanism is a bit better than the Kidco, since you do not have to lift the gate to open it, but that wasn't our experience. We used it on openings from 28" to 46" - note that some places list it as up to a 48" opening, but that wasn't our experience. 5. Summer Infant Deluxe Stairway Simple to Secure Wood Gate. Usually about $40. This is a great bang-for-the-buck cheap baby gate that has some great build quality, safety, and usability. We were really impressed by what Summer Infant has squeezed into this inexpensive baby gate that's designed for the top or bottom of stairs. Out of the box, it had a nice classic wooden style that reminded us of older gates, but this one definitely has much better modern features. Assembly and installation was just as involved as the other stair gate options given that you need to attach everything to the side walls and make sure that you have a good anchoring there (i.e., either to a stud in the wall, or using super strong anchors - preferably not the little ones provided with the gate). We were able to install it in our rather wide (44") hallway at the top of our stairs without any issues. One side was attached to the top bannister post of the stairs (a 3" x 3" wood post), and the other side to the wall that happens to have a stud in it. If you're not comfortable screwing the gate into your wooden bannister, then you can buy a separate installation kit that basically uses straps to attach that side to the bannister so you don't need to put holes in the wood. While we got it into a wide 44" opening, it can go even wider - up to 48" wide, according to the manufacturer (or as narrow as a 30" span). So that's pretty wide, especially for a relatively inexpensive gate. The gate itself is 32" tall, and it gets mounted about 1" above the floor, making it about 33" tall in total. which is about average for a baby gate. While we mounted the gate at the top of the stairs, it could theoretically be mounted in doorways or anywhere else, since the upper and lower unidirectional swing-stoppers are removable. Those are important safety features when used by the stairs, but not necessary when used anywhere else. We liked the one-handed operation, the strong and sturdy construction and hook-latch closure. We didn't like that you can't just swing it shut, the wood was a lighter color than in the photos, the wall mounting kit is pretty confusing and imperfect, and it doesn't include the kit for attaching to your bannister without screwing into it. But then again, it's only $40 so maybe those concerns aren't that major! Interested? You can check out this Summer Infant Deluxe Baby Gate here. The Regalo top-of-stairs baby gate fits all of our criteria, and has several other great features. First, this is one of the only gates on the market that attaches without having to drill holes or install screws into your railing posts. It uses Velcro straps, so it was very easy to install. Second, it can be opened and closed with one hand, and does not automatically swing shut (so you can leave it open during naps, or when everyone is downstairs already). Third, the railing comes with hardware so that you can attach it to two railings (one on each side), two walls (one on each side), or a wall on one side and railing on the other. Finally, the gate is well-reviewed for being sturdy, reliable, difficult for little kid hands to open, and long-lasting. The gate also swings both directions for convenience, though some may not like it swinging out over the stairs. People report using it on openings from 26" to 42" wide. A few limitations though. First, one of our testing babies figured out how to rip open the velcro and basically remove the entire gate from the railing! So that was scary. Also, there have been some recent reports about lower quality craftsmanship, like some flaking paint, failed welding points, etc. Note that our unit didn't have any of these issues, but just keep that in mind. Here are some more details about how we found the best baby gates! Once your baby starts crawling and pulling up on furniture and toys, you will realize just how dangerous your house is! Stairways, fireplaces, exterior doors, glass furniture, fragile decorations. You name it, your baby will soon find it! To prevent your baby from getting hurt or gaining access to a certain area, most parents install baby gates at various places around the house. For instance, at the top and bottom of stairs, blocking a fireplace, or in the middle of a room as a little baby corral. Parents also use them to secure play areas, like a play-room, without having to close the door. 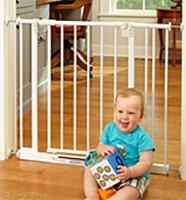 Baby gates are also great for keeping that curious, jealous, or toy-gobbling dog away from a newborn! Not surprisingly, there are different gates that are better or worse suited for each of these uses. Where you plan to put the gate matters! Simple swing-open gates are great for doorways and at the top and bottom of stairs. But the ones that are tension-fit require walls on each side to support the outward pressure mounts; do not attempt to install these tension-fit gates in situations where one side is a wall and the other side is a railing post (like at the top or bottom of stairs). The outward pressure mounts will push the railings to the side and eventually give you a wobbly railing. The outward pressure mount gates are easy to install, but simply not safe near stairs. Also, do not install a gate at the top of the stairs if it has a bottom (step-over) rail - this is a serious tripping hazard, and should always be avoided. Because of these different uses of baby gates, we categorize gates by their primary uses: ordinary/doorways, versus top-of-stairs (sometimes called a banister gate). If you ever plan on using the gate near the stairs, then check out something like the Kidco Safeway gate, which is fantastic and can also be used in doorways if needed. The other option is to seal off an entire area (like a baby corral), or seal off a room with a very large entranceway; in either case, something like the North States Metal Superyard gates would work really well. The gate needs to be sturdy! Babies will amaze you with their ability to foil all your best attempts to keep them safe. They will try to pull the gate, push the gate, climb the gate, lean on the gate, or bite the gate! All of the gates recommended below are rated as the best in terms of sturdiness, to help you keep your sanity when you can't have your eyes on baby 100% of the time. And if you're using a baby walker (see our best baby walkers here), you'll want to be extra careful! The locking mechanism needs to be child-proof! This seems obvious, but there are a lot of gates on the market with locks that babies figure out before their second birthday. Avoid gates with a simple button lock, or a simple lift-open mechanism. Your baby may not figure out how to open the gate now but give him or her another year and you'll be kicking yourself for not buying a gate with a better, relatively child-proof lock. All of the gates recommended below have well-reviewed locking mechanisms that are reliable, easy for parents to use, and difficult for babies to figure out (or physically grasp). Little fingers pinch very easily! We don't recommend any of the wooden retractable gates, wooden expanding gates, or the gates with the pressure locking bars. These increase the risk of finger pinching, and in some cases lacerations, and should be avoided. But if you have a pet-only home and you're trying to keep your dog in certain areas, they're quite good for that purpose! You want to open the gate with one hand! Carrying the baby? A laundry basket? Groceries? Talking on the phone? The last thing you'll want to do is put something down because both hands are required to open the gate's locking and swing mechanism. All of the gates recommended below have well-reviewed locking mechanisms that can be opened with one hand. It's a complicated trade-off between making it difficult for a baby to open, while keeping it easy enough for an adult to open with one hand. This usually means the locking mechanism will require larger hands to grip and pinch/rotate/slide. As a result, some adults with smaller or weaker hands (like older relatives) tend to have some difficulty with modern gate locks. Make sure your doorway isn't too wide! Some baby gates come with extensions to accommodate larger doorways, but other gates do not. Keep in mind, if your door opening is greater than 31" wide, then you will likely need at least one extension. In our recommendations, we provide specifications regarding door widths and when available, links to extension kits that fit the application.